You can help bring the Bible in Braille to more people like this young school pupil. When you can’t see words on a page, how do you read the Bible? While listening to recordings or having someone read to you are helpful, there is nothing quite like reading the words for yourself. That’s why Braille Bibles are so important for people who have limited visibility. 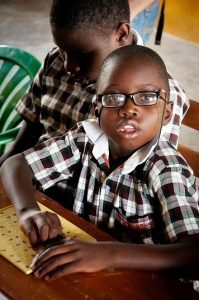 Uganda has one of the highest rates of visual impairment in the world, with approximatey 2.6 million people classified as visually impaired or blind – that’s 6% of their population. There are many reasons for this high level of sight loss but measles and cataracts are common causes. 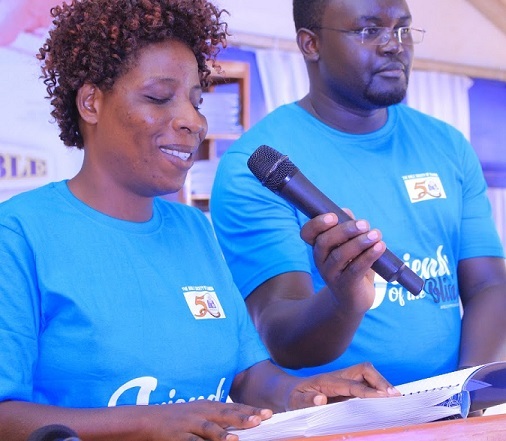 There was a recent celebration in Uganda when many gathered at the dedication of the full Braille Bible in the Luganda language. It is amazing to think that this is only the world’s 45th complete Bible translation in Braille. This was such a joyful occasion marked with dancing and singing as people rejoiced over Bible readings from the Braille Bible! The first Bible reading from the Luganda Braille Bible. Will You Be a Friend of the Blind? The Bible Society of Uganda is visiting schools to give Braille Scripture to pupils. They are also bringing Braille to remote areas so that people who are isolated by blindness can know they are valued and loved. Your gift today could give someone in Uganda the opportunity to read God’s Word for the first time. 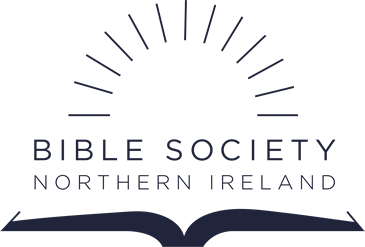 £5 can give a Braille Bible booklet to a school pupil, introducing them to Jesus. £400 is the cost of a full Bible which comes in 40 large volumes. It is very expensive, so your donation could really help.